Oil on canvas, 74 x 97 cm. In 1836, Marstrand travelled to Rome, where he stayed for about five years. Here, he carried out several paintings with more or less staged subject matter from the Romans’ everyday and celebrations. 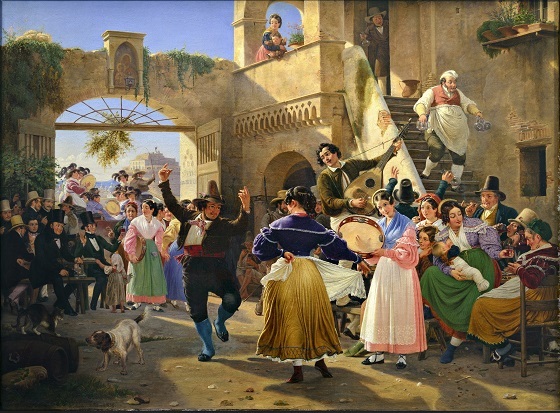 In an Osteria in Rome, there is dancing and celebration with plenty of local colour, good food and drink. To the left, there is a group of darkly clad gentlemen. They are members of the Danish colony of artists in Rome, including Jørgen Sonne, Jørgen Roed and Constantin Hansen. They are joined by a few distinguished guests, including the painting’s commissioner, who is lifting a glass, court wine merchant and Councillor of State Christian Waage Petersen. The contrasts between north and south fascinated Marstrand, and his portrayal of the Romans is idealised, colourful and charming. As is often the case in the artist’s populous paintings, the subject has a highly staged character.